Providing a networking experience with your event app can mean the difference between unhappy attendees or engaged and productive participants. Your event app should help streamline your attendee’s experience. When the bottom-line goal is for attendees to create meaningful change, it’s important to give them the tools to do it. Security is important. Whether high-profile or not, security is a top priority! Our networking option provides a secure login with private contact information, but still allows for direct communication between attendees. 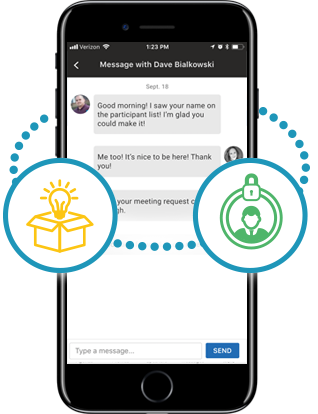 Attendees can request meetings and have them auto-scheduled at a mutually convenient time, with automatic notification emails to all parties – a great productivity boost. Connecting the right buyers to the right sellers is key. Our Matchmaking feature is ready to unlock the potential. Use the groups feature to facilitate open discussions by allowing participants to create and join both public and private groups.